I described the wedding costume we made for Orest and Cheryl in a previous post. Today i would like to show you all some examples of original costume pieces from that region. One problem that we face today in replicating traditional costumes is finding cloth that works. There is some very nice linen available today, but it is not as heavy as the original homespun. 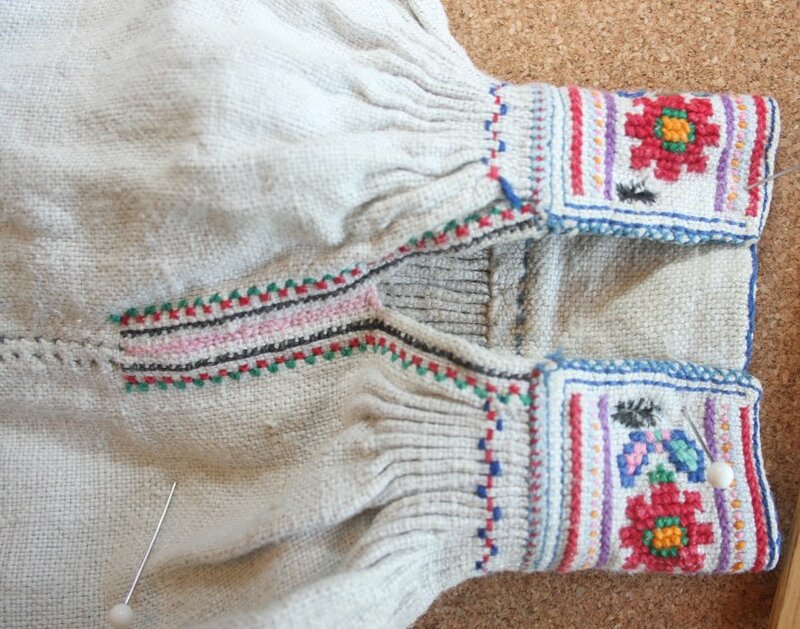 On the one hand, it makes the garments cooler to wear, on the other hand, they do not move in the same way, and when the costume is smocked, then the 'tubes' do not come out in the same way they did originally. One usually has to compromise, and one can still get a very nice result. Men's shirts from Turka county are well known in that they are embroidered on the shoulder, as most regions of Ukraine they are not. Here is a graphing of a man's shoulder piece from Krawchuk. Or rather, half of it. 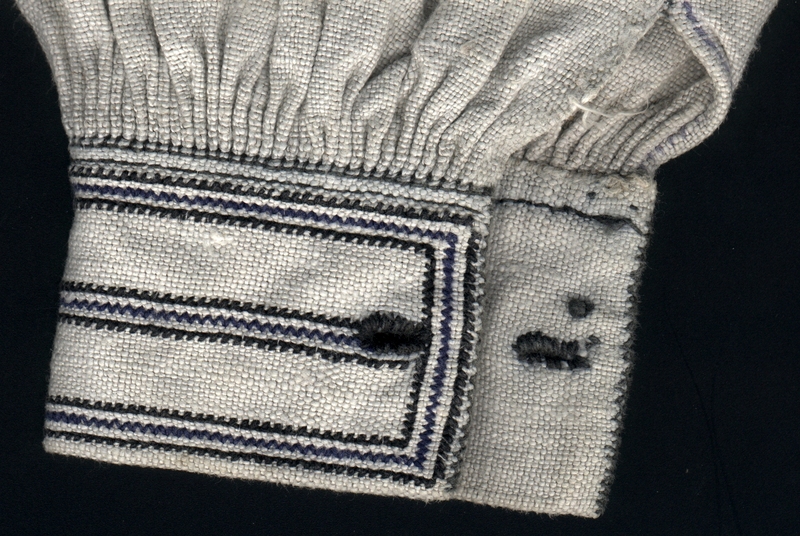 You can see the joining stitch indicated towards the bottom. 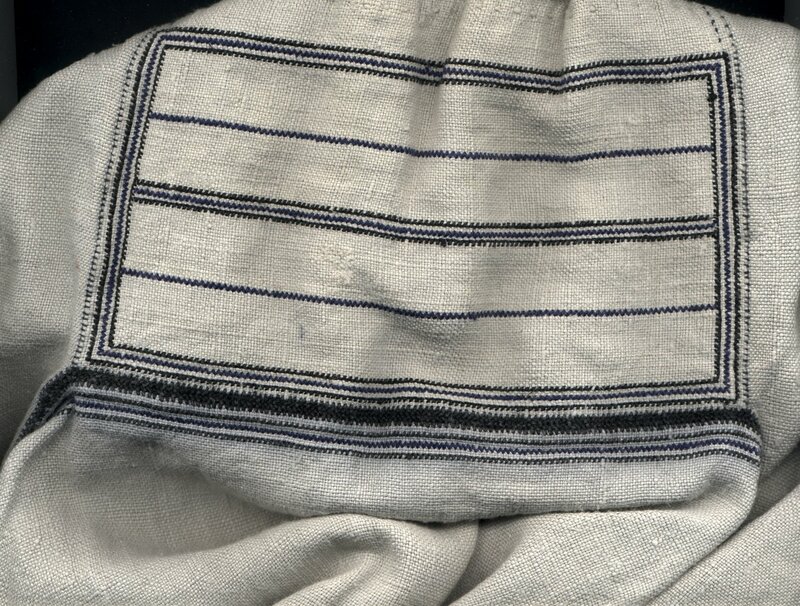 There are three rows of herringbone stitch indicated on the upper sleeve. 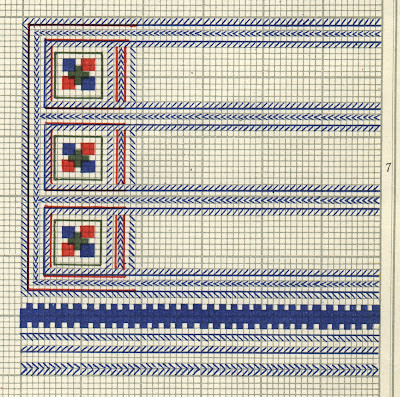 I had assumed that this was schematic, and that the stitches would fill the area, only showing their execution by texture. When i actually saw an original shirt, i found that idea was mistaken. Here is a photo of the shoulder piece of a man's shirt. 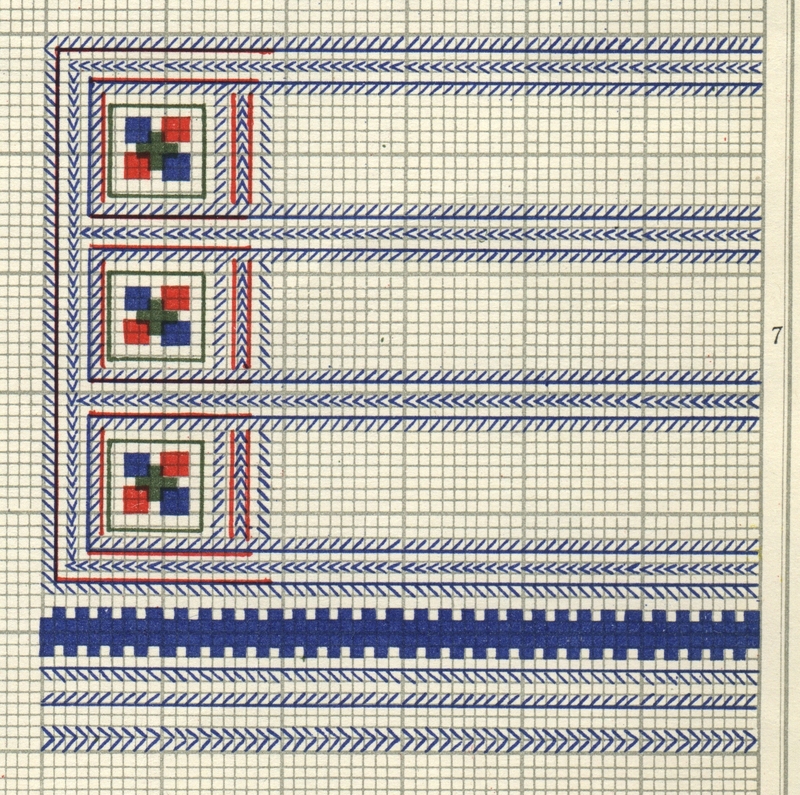 The embroidery has been reduced to the basic rectangle that forms the outline of the design above. You can see, however that the design is basically the same, and that the herringbone is quite visible. The embroidering threads being finer than the ones in the homespun. 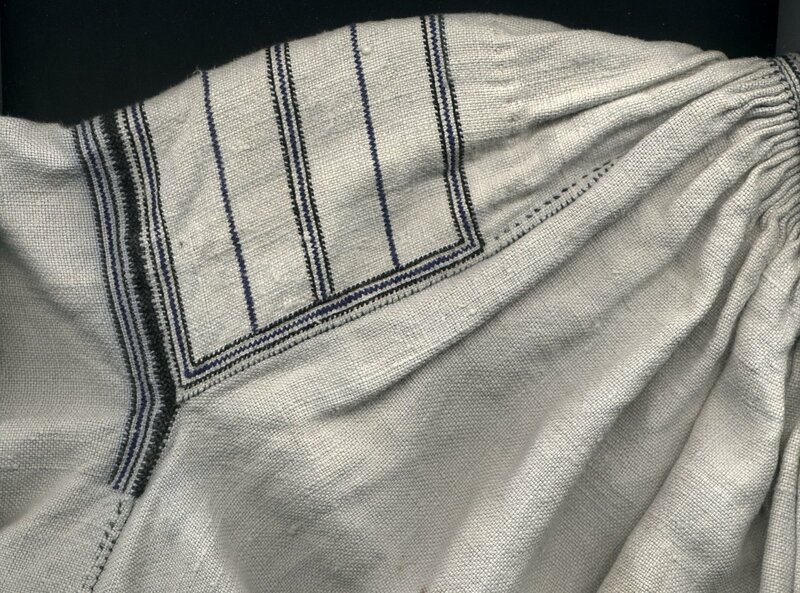 Also like the graph, the joining stitch is visible, and three rows of herringbone on the upper sleeve. Here is a side view of the shoulder piece of the same shirt. Here you can see the sleeve at left, the shoulder insert on top, and the main body of the shirt on the right. I had made Orest's shirt with the ustawka, the inset sewn on top of the main body, in the way that they do in central and Northern Halychyna. 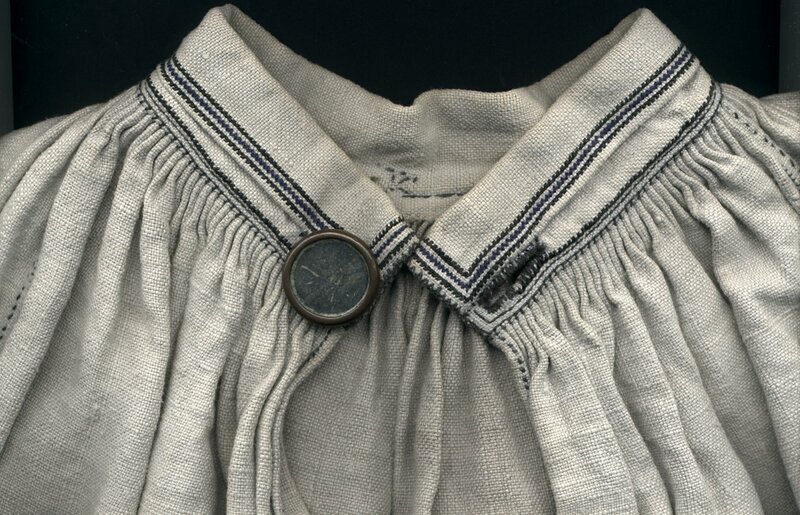 However, this shirt has the inset sewn on to the side of the shirt, and the whole top smocked into the collar, just visible at the upper right. This is the technique used in Podillia, Pokuttia and the Hutsul region. The even rows of gathers form part of the design, and one cannot get the same effect with lighter fabrics. Here is a photo of the collar of this shirt. The topstitching holding the collar tog﻿ether and holding the smocked pleats in place have become elements in the embroidery design. The same thing was done on the cuffs. Here is the shoulder piece of a woman's shirt from the same village. You will notice a wider range of colors. When DMC first arrived in the area in the early 20th cent., it was like 'OMG! just LOOK at these colors! Let's USE them! 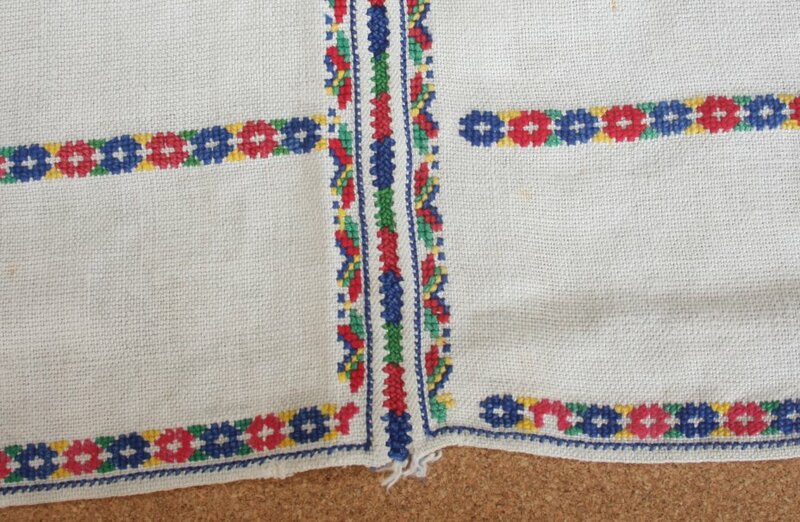 And the embroidery in some areas became very colorful. The same thing happened in the towns and cities further north. The shoulder inset of this shirt is also sewn to the side of the body pieces. 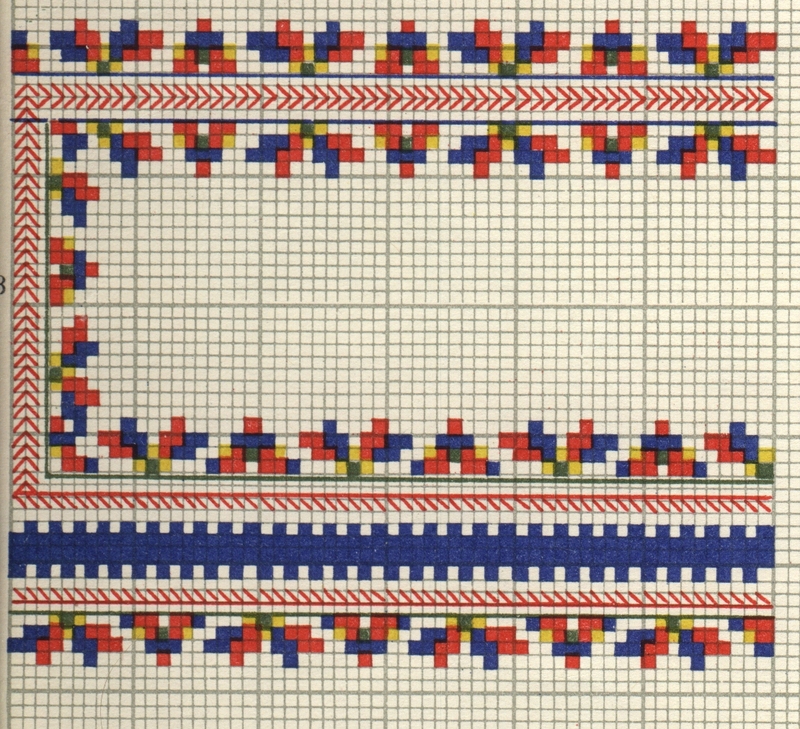 The main design is in cross stitch, bounded by a row of red braid stitching above and below. Ukrainian embroiderers do not like to have plain straight edges to their designs, so there is a bordering motif on the top, and rows of herringbone underneath. Below that you will notice that the upper sleeve is smocked into the shoulder piece, and there is decorative stitching on either side of and on top of the smocking. Here is a closeup. As you can see, each individual pleat, or 'tube' is hand sewn onto the shoulder piece. A similar thing was done with the cuffs of this shirt. 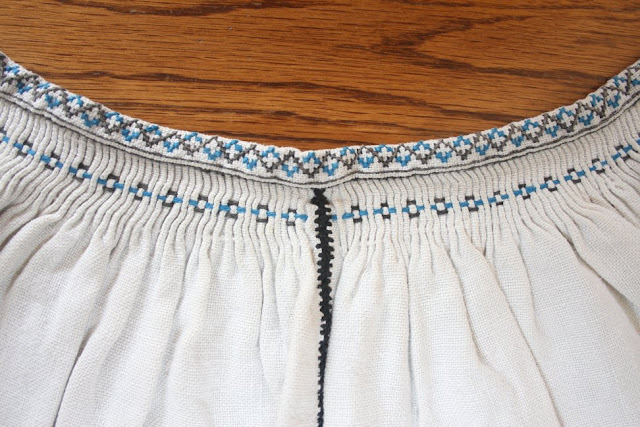 Notice the decorative motifs embroidered along the opening. Sometimes this continued for some way along the sleeve seam, as we have already seen in the Drohobych area shirts. ﻿The collar and cuffs were originally held shut by a cord or ribbon passing through the two buttonholes, called a 'harasiwka'. Later this was replaced by buttons or studs. 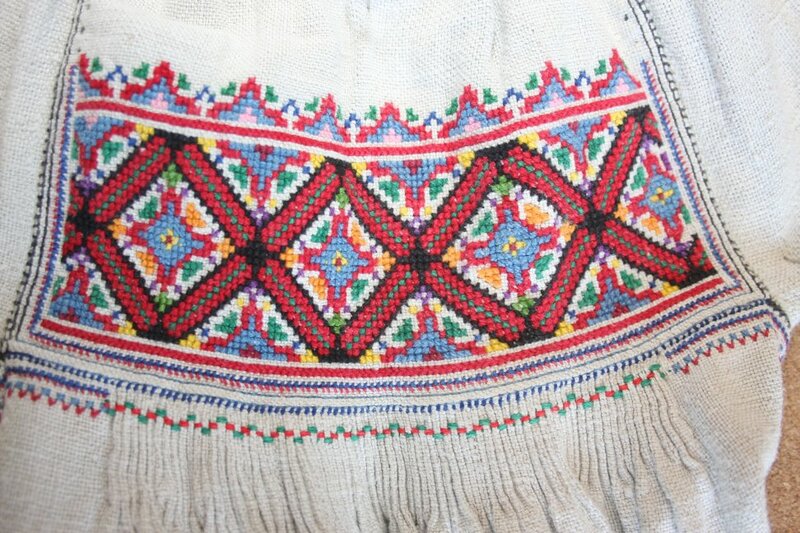 Krawchuk also gives us this example of embroidery from Turka county. This is from the shoulder piece of a man's shirt. Here is an apron from the same region which is in Orest's personal collection. ﻿You can see that it is substantially the same as the one we made for Cheryl, but it has the embroidery pattern given us by Krawchuk above. Here is a closeup. This is a very typical color combination for the Boiko region, although there is a wide variety of color schemes and techniques used. 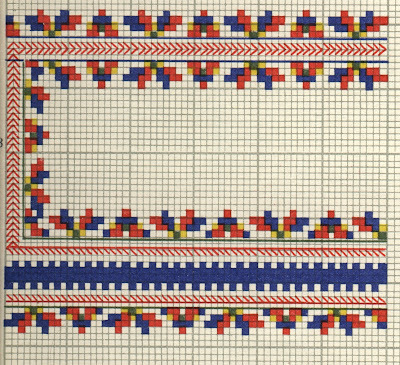 You will notice that the joining stitch is executed alternately in blue red and green as well. 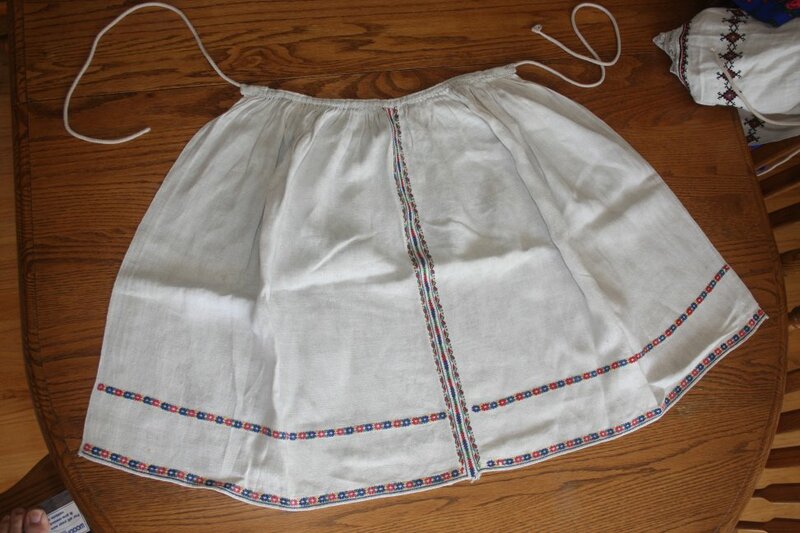 Here is the waistband of a different apron, showing how it is smocked into the waistband as well. It is always best, when making a traditional costume to have examples of originals to examine. One should not copy them slavishly, as in the individual villages there was quite a bit of variety, and each person added something of themselves to their own projects. Nevertheless, one should have a good idea of the traditions of the area, and the vocabulary of motifs, designs and cuts. I would have done some things diffeently with the wedding costumes with what i know now. But that is always the case. Thank you for reading, as always, I hope you have found this helpful and inspiring. Feel free to contact me with requests for research. I hope to eventually cover all of Europe and the Former Russian Empire/Soviet Union. I gratefully accept tips on source materials which i may not have. I also accept commissions to research/design, sew, and/or embroider costumes or other items for groups or individuals.